In the last few weeks Lebanon and Palestine have been the scene of dramatic and most unsettling events, from the outbreak on 20 May 2007 of heavy fighting between the Lebanese army and the Palestinian faction Fatah al-Islam near the northern city of Tripoli to the eruption of internecine Fatah-Hamas violence in Gaza which led to the effective partition of Palestine on 15 June. These two proximate conflicts may seem to have different causes, but they closely linked: for they mark the culmination of a process, aimed at undermining the Palestine Liberation Organisation (PLO) and its then leader Yasser Arafat, which has its origin in the early 1980s. At that time the initiative in this matter was taken by two states, Syria and Israel, both of which for reasons of their own state interest sought to promote rivals to the PLO. The pithiest summary of this policy had come under the United States presidency of Jimmy Carter (1977-81), whose national-security adviser Zbigniew Brzezinski summarised it in the infamous dictum: "Bye-bye, PLO". Brzezinski's hope has now been partly realised. The comeback of the PLO in the early 1990s, when it negotiated the Oslo accords with Israel in 1993 and was able to establish the Palestinian Authority in Gaza and the West Bank, has been dissipated - as a result of its own corruption and inefficiency, Hamas sabotage, and Israeli intransigence and bad faith combined . But it is questionable whether this has brought the advantages Brzezinski, and his Syrian and Israeli collaborators, hoped for at the time. Fred Halliday's "global politics" column on openDemocracy surveys the national histories, geopolitical currents, and dominant ideas across the world. "America and Arabia after Saddam"
"Political killing in the cold war"
"A transnational umma: myth or reality?" "Iran vs the United States - again"
"A Lebanese fragment: two days with Hizbollah"
"A 2007 warning: the twelve worst ideas in the world"
"Sunni, Shi'a and the "Trotskyists of Islam"
"Al-Jazeera: the matchbox that roared"
"Palestinians and Israelis: a political impasse"
The fighting around the Nahr el-Bared refugee camp near Tripoli that began on 20 May pitted the Lebanese army against a militant Sunni Islamist group, one of many that have emerged in recent years among the Palestinians in Lebanon. Fatah al-Islam, which first announced its existence on 20 November 2006, has fought effectively against the attempts of the Lebanese army (formally prohibited since 1969 from entering the twelve Palestinian refugee camps in the country) to dislodge and destroy it, and an allied militia has since begun operations in support in the Ein el-Hilwa camp near Sidon, in the south of Lebanon. The Sunni militants who now control the Palestinian camps are not disposed to negotiate with the Lebanese authorities, whom they consider agents of the United States and of Israel; nor, despite accusations by the Beirut government to this effect, are they in any consistent way acting under the orders of the Syrians. Their growth is certainly a result of the way that Syria (along with Iran) tried to lessen the influence of the PLO in Lebanon in the 1980s, at first by promoting splits within Arafat's Fatah movement and boosting the financial and military resources of smaller, dissident groups. But from the mid-1980s the initiative in these camps passed to the new militant Sunni groups, and their influence was greatly enhanced by the 1993 Oslo agreement between the PLO and Israeli. Oslo meant that the 400,000 Palestinians in the camps in Lebanon would forfeit their right to return to the lands they and their parents had left in 1948, and in consequence many denounced the agreement as an "Arafatist-Zionist conspiracy" indulged by the "slumbering" Arab regimes and their "sheikhist" and pro-Gulf-states clergy. These new militants turned increasingly to the rhetoric of jihadi Sunni militancy and fell, through many channels of informal contact, under the influence of al-Qaida. The link was consolidated by the fact that one of the intellectual parents of al-Qaida and of the whole ideology of a global jihad was himself a Palestinian: Abdullah Azzam. This meant in effect that the Palestinian population in Lebanon had, by around 2000, fallen under the control of religious and militia groups that owed loyalty to no state. Syria had initially allowed them to develop, as a function of Damascus's rivalry with Arafat, but in time these militants came increasingly to ally with the Muslim Brotherhood in Syria, the main opposition to the Ba'athist regime of Hafez al-Assad. Iran, meanwhile, had also backed the expulsion of the PLO (via its Revolutionary Guards in Lebanon, and Hizbollah ally), but the Palestinian jihadis in the Lebanon camps were too consumed by the anti-Shi'a ideology of al-Qaida and its associates in Pakistan, Saudi Arabia and Afghanistan to see much of merit in this. The Lebanese state, precisely because it wishes to deny the Palestinian refugees permanent residence or employment and other rights inside Lebanon, was for a long time content to leave the camps entirely alone. At the same time the educational and other welfare organisations that once provided minimal support within the camps have been driven out by the jihadis: as a result, educational and health standards have fallen. A ferocious puritanism shared with their al-Qaida confreres leads the jihadi groups to ban videos, censor television to exclude all female newsreaders and impose tight social controls on women. Among the most ominous aspects of this new social regime is the right given to any jihadi male to kill what he suspects of being "communist women", by which is meant any woman who breaks with patriarchal and authoritarian control. This, then, is a crisis that has been growing for over two decades. The militant explosion of violence in Tripoli and elsewhere cannot be isolated from these longer-term currents, nor explained away by false assertions from Lebanese politicians of Syrian responsibility. The consequences of this jihadi hegemony within the Palestinian camps may be both ominous and long-term. In this light, the rising intolerance and anger of much of Lebanese society (and the incomprehension of much of the rest of the world) need to be channelled into understanding; an indispensable guide here comes in the form of the very timely publication in English of a study of the rise of Islamism in the Palestine camps by the French political anthropologist Bernard Rougier, Everyday Jihad: The Rise of Militant Islam among Palestinians in Lebanon (Harvard University Press, 2007). Paul Rogers, "Iraq's cloudy horizon"
Robert G Rabil, "Lebanon, Syria, Iran: lessons of Sharm el-Sheikh"
Mary Kaldor & Mient Jan Faber, "Palestine's human insecurity: a Gaza report"
Tony Klug, "Israel-Palestine: how peace broke out"
Rosemary Bechler, "Palestinians under siege in the West Bank"
Hazem Saghieh, "The Arab defeat"
Omar Al-Qattan, "The secret visitations of memory"
Ghassan Khatib, "Hamas's shortsighted manoeuvre"
Zaid Al-Ali, "Lebanon's Palestinian shame"
The Hamas insurrection in Gaza is the parallel culmination of this same story. Hamas is the modern form of a trend that has existed within Palestinian society for many decades, linked to the pan-Islamic movement of the Muslim Brotherhood. The brotherhood, established in Egypt in 1929, played a significant part in the first Palestinian uprising in 1936: hence the invocation today by Hamas of the Muslim Brotherhood leader Izzeddin Qassam (killed in 1935), a calculated attempt to subvert the legitimacy of the secular PLO and Fatah and reassert its own historic credentials. No one would argue that either Israel or Syria created Hamas on its own: but in the 1970s and 1980s Israeli did allow Islamist educational groups in Gaza and the West Bank to open colleges and receive funding from Saudi Arabia, just as Syria gives sanctuary in Damascus to the exiled political leader of Hamas, Khalid Meshal. In any case, Hamas's loyalty has gradually - since the outbreak of the first Palestinian intifada in 1987 and the split among Palestinians over the Oslo accords - switched more and more to Iran (which has armed and financed Hamas since its election victory in January 2006). The emergence of rivals to the PLO and the new presence of Iran in Gaza, compounding its influence via Hizbollah in Lebanon, touches on a much broader and absolutely central issue in the politics of the contemporary middle east and the world: the relationship between guerrilla and militia groups on the one hand, and regional states on the other. In times of conflict, it has been routine for states to accuse all their guerrilla and irregular rivals of being "agents" or "proxies" of other states. In some instances (not least during the cold war) this was true: Israel ran the South Lebanese Army, the Arab states set up the PLO in 1964, Iran and Iraq backed each other's Kurds, the Afghan mujahideen were financed and trained by Pakistan, Saudi Arabia and the CIA. In other cases, the charges of "state-sponsored terrorism" or state control have been exaggerated. No state, regional or other, had any significant influence over the Iranian opposition in the revolution of 1978-79, just as none had ever controlled the Algerian FLN in its war of independence against France. Despite Turkish claims of Greek, Syrian, Armenian and Russian involvement, no state to any significant degree backs the Kurdish PKK guerrillas. 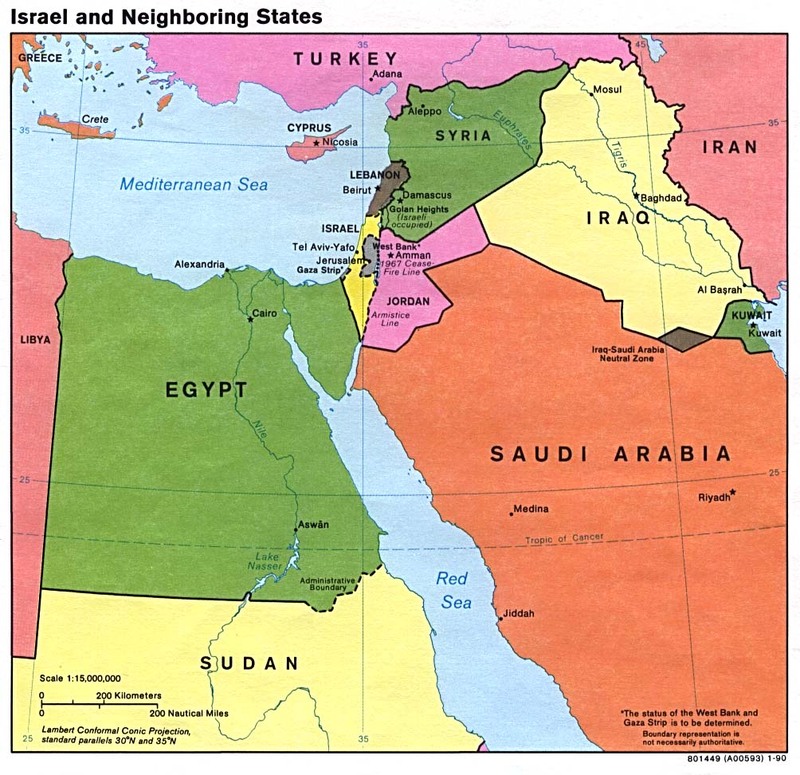 In regard to regional states, Israel was never a simple "stooge", "sentinel" or proxy of the United States, any more than Egypt, Syria or Iraq were of the Soviet Union. There is an evident contrast here in the Lebanese and Palestinian events of May-June 2007: while it would appear that in the case of Lebanon external state influence is much less than is claimed, in the Gaza insurrection the hand of Iran could be inferred. In other contexts, there was an initial link to states that the guerrillas or others later cast aside. One of the most important consequences of the Arab-Israeli war of June 1967 was that Egypt lost control of guerrilla and rebel groups in the Arab world, not only with the PLO and Fatah, but in the twin wars then taking place in North and South Yemen, where radical nationalist groups once controlled by Cairo broke away to denounce their "petit-bourgeois" patrons. A comparable process was to happen with the Afghan guerrillas after the Soviet forces pulled out in 1989: it was at that point, and in the context of the US alliance with Saudi Arabia to expel Saddam Hussein from Kuwait, that the hitherto pliant pro-western al-Qaida and others turned against the west and set off on the road to global jihad and 9/11. What has happened in the Palestinian camps is the same story: for all that Syria and Iran helped create the context for the rise of Fatah al-Islam and other jihadis in Lebanon, the groups now operating in the camps are linked to the enemies of the Damascus government and are fiercely anti-Shi'a. Most dramatically, if as yet not sufficiently acknowledged, is what has happened among the Shi'a in Iraq. It could be said in 2003-04 that Iran exercised broad influence, if not everyday control, over the Shi'a of Iraq and their established leaders, such as Ayatollah al-Sistani; but in the last two years this has ceased to be the case. With the rise of Muqtada al-Sadr, and the subsequent fragmentation of his own militia, and with the cycle of spontaneous violence flaring between Sunni and Shi'a, Tehran too has to a large extent lost control in Iraq. In this sense, the decision by Iran and the US to negotiate face-to-face has probably come too late: had they met and reached an agreement over Iraq in 2003-04 (as they did over Afghanistan in the Bonn conference of December 2001), they might have been able to stabilise and reinforce the post-Ba'athist government in a way that most Iraqis at that stage evidently wanted. The events of the past month in Tripoli and Gaza reinforce the point that such contingencies, dramatic surprises, and sudden shifts may continue to occur. If the future of the middle east as a whole now rests above all on the outcome of the war raging in Iraq, then no one can be sure whether it will be established states (the US, Iran and Saudi Arabia most prominently) or the many and violent insurrectionary groups that will in the end prevail. In this regard, history taught me a robust lesson early on. In 1974 I published my first book, Arabia without Sultans, an analysis of the post-1967 revolutionary movements in the southern part of the Arabian peninsula. While it covered the emergence of "Marxist-Leninist" forces in North and South Yemen, its main focus was on the guerrilla war in the southern, Dhofar, province of Oman. In the vision of the times, this was the "weakest link", the "single spark to light the prairie fire", the road by which the Yemeni revolutions would spread to the oil-producing Arab Gulf and sweep the feudal sultans, emirs, sheikhs and kings aside. Walking with the guerrillas on my first visit to the "liberated areas" of Dhofar, in 1970, I kept recalling the great passage in Trotsky's History of the Russian Revolution where he expatiated on the law of combined and uneven development. Dhofar was to be the base, the Yenan, the Sierra Maestra, of the Arabian revolution. It was not to be. A year after the book was published, and even as we were trying to smuggle the journalist John Pilger into the guerrilla areas to cover the war for the New Statesman, the movement in Dhofar was crushed and the border with South Yemen sealed: a newly revamped Omani army, with help from the United Kingdom, Pakistan, Iran and Jordan had won the war. The state system had prevailed. Structure had contained agency. The South Arabian revolution, confined to the increasingly divided and economically unviable People's Democratic Republic of Yemen, soon turned in on itself and, with the merger of North and South Yemen in 1990, collapsed. Thus it was that when, two years later, I began work on a book about the nature of the Shah's regime in Iran, I vowed to reject the voluntaristic, Trotskyist-Maoist excesses of my earlier book. The study of Iran, a sober and well-researched volume, was completed in the summer of 1978. Weeks later, the Iranian revolution began. Millions poured onto the streets day after day. A political general strike, the largest and most momentous in history, gripped the country. The hitherto neglected clerical leader Ayatollah Khomeini emerged as the symbol and inspiration of these tumultuous events. On 15 January 1979 the Shah fled the country. Society had overthrown the state. Agency had defeated structure. History had wrong-footed me again. Now, Lebanon, Palestine and most of all Iraq have become the focus of this state-society conflict: it is anyone's guess which will prevail.